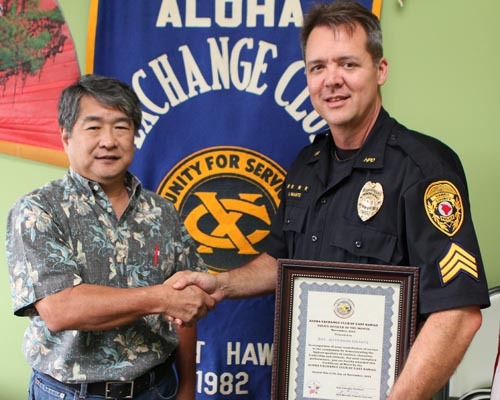 The Aloha Exchange Club of East Hawaiʻi recognized Sergeant Jefferson Grantz on Thursday (November 17) as “Officer of the Month” for November. 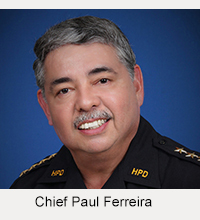 Grantz, who is assigned to the Hāmākua District, was honored for his patient negotiation with a suicidal minor on September 30. When the runaway boy held a knife to his chest on the roof of an abandoned house and threatened to kill himself, Grantz spent three hours calmly negotiating with him until the boy gave up the knife. No one was injured during the incident. Afterward, the boy was taken to the hospital for a mental health evaluation. 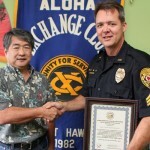 Captain Mitchell Kanehailua Jr., who nominated Grantz for the honor, commended him for his skill, patience and compassion. 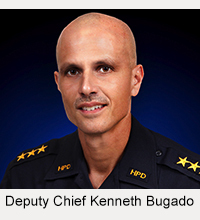 “Sergeant Grantz’ skillful control of the scene and patient negotiation with an unpredictable individual led to the peaceful resolution of this situation,” Kanehailua said. “Sergeant Grantz and his officers also displayed compassion to the juvenile and his family by having the boy taken to the hospital for further treatment.